the artworks annual exhibition opens this weekend at blackthorpe barn in the heart of rural suffolk. i am one of thirty artists exhibiting new work in this art exhibition. each artworks artist is allocated a space in the barn and here is a small picture of my wall of (very) small paintings. these paintings are very possibly the smallest paintings in the artworks exhibition, and my intention was to produce a series of delicately textured paintings which would require close scrutiny so that the beams (in all their rustic heavyweight charm) did not entirely steal the show. 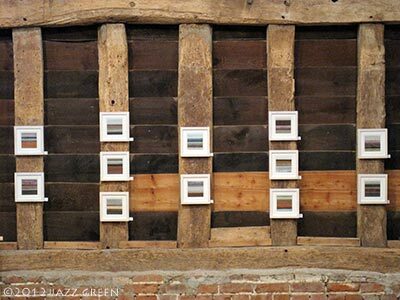 these small paintings are framed in white wood frames (using natural liming wax), floated within extra-deep window mounts to give a degree of separation and independence from the exposed beams and overlapped timbers of the barn’s rustic interior architecture. plain white walls do help to concentrate the gaze when someone happens upon an artwork for the very first time, where there is no background noise to distract from the ‘get to know you’ conversation (or creating a dialogue as some artists will call it, but a conversation seems much more personable). 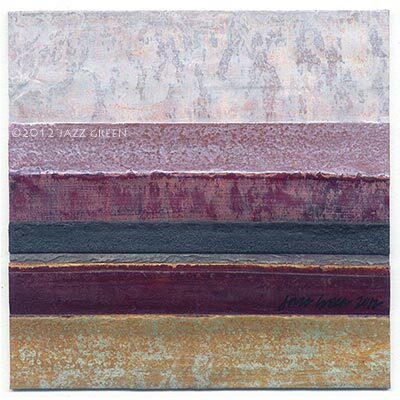 this series of (very) small paintings combine my rustic style of painting with collage, constructed in many layers to create subtle accents of texture and relief within the surface, minimalist in composition offset by irregular striations and stacks of textured colour, to evoke everyday sensory elements of the rustic and the rural – walls, fences, boundaries, edges, horizon lines, buildings and structures. sometimes it’s the smallest of things that momentarily hold the attention. the textures, colours and aromas in the garden on any given day, a purple-leafed sage in a terracotta pot, the dust, dirt and cobwebs in the shed as you sort through a jumble of odd-sized plant pots, the aroma and texture of compost in your hands as you sow the tiniest of seeds, or the patina of waterlines on the inside of a rain bucket or watering can. these seemingly mundane visual experiences, now insignificant memories, seem to have filtered through when making these small paintings, perhaps to acknowledge some of the humble pleasures of rural life, and to cast away the less pleasing aspects, as things are ‘felt’ and layered in one’s memory, without recourse to a more ‘literal’ narrative. if there (ever) was an overarching idea, an underlying motive, a subconscious need, it was a need to evoke such sensory memories – in a way which felt authentic, honest and pure, quietly evocative, modest in every way – as a small expression of retreat or escape, back into a small world which i could claim as my own, and from there on in, came the titles. rural life has been an inevitable influence in these (too?) small paintings as i continue to be drawn to the colours and textures of time passing, a humbling antidote to the relentless pursuit of ‘perfection’ in contemporary life. the artworks exhibition is open daily, 10am to 5pm, from 8th to 30th september 2012. Valerie Armstrong, Mike Ashley, Lyn Aylward, Penny Bhadresa, Gillian Crossley-Holland, Helen du Feu, Genista Dunham, Janet french, Chris Gamble, Roger Gamble, John Glover, Jenny Goater, Joss Goddchild, Jazz Green, Lynn Hutton, Alison Jones, Eleonora Knowland, Christine McKechnie, Katie Millard, Elaine Nason, Carol Pask, Anne Paton, Doug Patterson, Ben Platt-Mills, Ursula Kit Price Moss, Lizzie Sanders, Colin Slee, Constance Stubbs, Liz Waugh McManus, Virginia Wright. 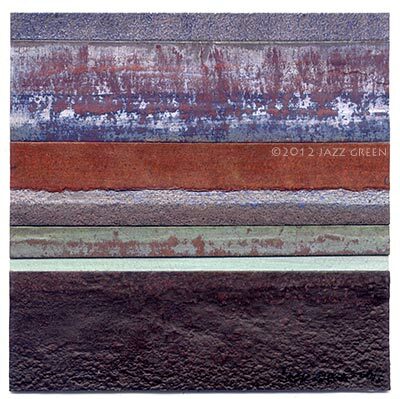 on: Saturday 8 September 2012 by jazzgreen. I was transported by your ‘purple leafed sage in a terracotta pot’. The paintings are beautiful. Good luck with your show. Absolutely love your found painting photos, and lots of the paintings and art work too , in fact most of it ! I have been fascinated with surface textures for years and it’s nice to discover someone who ‘sees’ like me ! Really interesting and thanks for inspiring me.